Shibowei.CIHIE.2018 The 23rd Expo &The 7th World Health Industry Conference was held on April 8 -10 at Beijing.China International Exhibition Center r with 50,000m²show areas. We set up 1800 standard booths,1216 exhibitors,9 national pavilions,13 domestic provincial and municipal pavilions,64925 visitors, 86 site purchasing organizations and 165 media.During this expo,we also held The 7th World Health Industry Conference which attracted 202 political leaders of many countries and embassy counsellor.Meanwhile, The launching ceremony of the China-Germany Big Health Industry Cooperation Alliance & China-Africa Big Health Industry Cooperation Alliance were highly valued and evaluated by leaders of the country. The trade effect of the fair and the advanced idea of the organizers had been recognized and praised by professional visitors in this industry, and were well known as "the barometer of the health industry" by the profession. Shibowei. CIHIE was found in 2003. Up to now, It has been successfully held for 23 times. This expo is approved by MINISTRY OF COMMERCE, PRC and jointly sponsored by China Good Agri-products Development Service Association、China Health Care Nutrition Council、China Association of Traditional Chinese Medicine、China International Exchange and Promotive Association for Medical and Health Care and Beijing Shibowei International Expo Co.,Ltd.Going through unremitting efforts of 13 years,Shibowei. CIHIE is developing from the original 80 booths to the current 1800 more booths、from 2000m²show areas to 50.000m² show areas、from 60 exhibitors to 1200 exhibitors, from China to the current 26 countries in the world and from 2000 visitors to the current 64925 visitors;This expo has been appraised as "National Key Guidance and Support Exhibition" for many years. 1、We only focus on the big health exhibition for 15 years and vigorously promote Chinese healthy industry development which is a high quality platform for enterprises to seek business opportunities, create an international brand image and strongly move towards the global market. After 15 years of precipitation, Shibowei.CIHIE nearly establish 500 thousands of high-quality professional buyers database. According to the characteristics, regional characteristics and exhibitor's needs, it will precisely orientate, invite and match the relevant purchasers and agents to expand the sales channels for the exhibitors. We set up the characteristic of exhibition area, hold a special meeting to attract investment and projects, set up the purchasing meeting and link up with the resources of all concerned parties for major projects in group location. 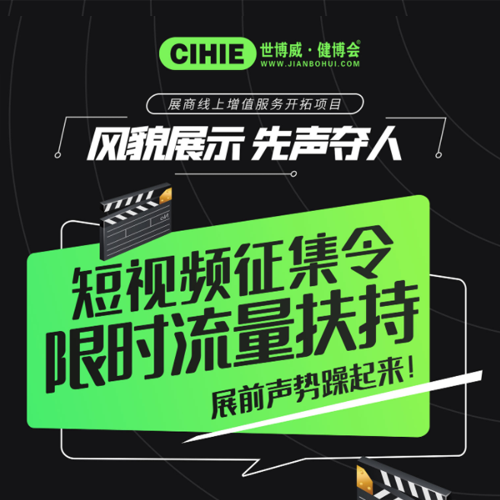 For 2018 CIHIE, We set a higher standard and goal, that is how to integrate more levels and more effective resources to make all participants achieve common progress through the exhibition platform.There will be more health-related brand enterprises and terminal channel resources to join us, especially for the selection of terminal channel resources.For exhibitors, you can use this platform to show your own brand and helps companies to optimize channel resources; For the on-site visitors,you can quickly get more exhibition info and quickly get the required info and exhibitor info ,so CIHIE can bring the new communication way for exhibitors and viewers to make it to be easier and more direct when contact. Meanwhile,the industry-related resources make you understand the industry trends at the first time for providing better service for the enterprises.Through the planning of meeting market changes and demand、integration of effective resources and meeting the different demand of different participants,CIHIE will integrate the business development、spatial marketing、trend release and information sharing etc which make you use CHICE resources to realize self improvement with mutual benefit and win-win way. 3.Chinese medicine chain stores, Gift companies, TV shopping, Online shopping centers, Trade service providers, Gift shops, important group-buying units etc. E: Beauty and slimming products area: Collagen, Coenzyme Q10, Skin care cosmetics, Functional cosmetics and slimming products, Natural beauty products,Chinese herbal beauty products,Foot therapy bath products etc. G: Diet therapy medicinal food products area: Diet therapy and medicinal food raw materials and related equipment, Chinese traditional medicine (chopped/traditional medicine etc), Chinese medicine pills, national features drugs and traditional Chinese herbal medicine, material and extract etc. H: Health-care products packaging area: Medicine and health-care production equipment and packing equipment, printing equipment, pharmaceutical packaging materials, etc. 1、Exhibitor’s products must have valid 《Business License》+《Product Qualification certificate》or other legal approval documents for the certificates and products. The quality of the exhibits should comply with the national relevant standards. 2、Exhibitors who make sure to attend the exhibition should firstly contact the organizer to choose their ideal booth position, then fill in the application form and agreement form with company seal. Mail or fax the form with your signatures to the organizer. This contract will be effective after being signed by both parties. Faxes or copies are valid.Booth Distribution Principle: apply first, Paid first, confirm first. 3、In order to help exhibitors win the market honor and expand the sales of products, the organizer set up the award activities, all the exhibitors who participate in the exhibition can join us, the awards are included "Gold Award "、"Good Faith Award" etc; (For details ,please ask the Organizing Committee).